NOTE: This interview was conducted in 2007. I’m retrieving it from the archives because the book was just reviewed in USA Weekend. Almost 1 in 4 pregnancies end in miscarriage. I didn’t know this until I had a miscarriage of my own. I was surprised to learn that it’s so common, since women almost never talk about it. I wasn’t able to find anything much written on the subject, either. I can’t say that the cultural silence surrounding miscarriage made the experience worse—I don’t know if anything could have made it worse—but it certainly didn’t make it any easier. The anthology, About What Was Lost: Twenty Writers on Miscarriage, Healing, and Hope, is a much-needed addition to the literature of mourning. I contributed an essay, and I recently interviewed the collection’s editor, Jessica Berger Gross, for Literary Mama. We talked about loss, the publishing process, and what it’s like to edit a famous author. The new anthology, About What Was Lost: Twenty Writers on Miscarriage, Healing, and Hope, is a much-needed addition to the literature of mourning. I contributed an essay, and I recently interviewed the collection’s editor, Jessica Berger Gross, for Literary Mama. We talked about loss, the publishing process, and what it’s like to edit a famous author. Miscarriage takes a lot of different forms. Sometimes, it happens so early in a pregnancy that the woman never even knows that she was almost a mother. Sometimes it happens later, when the pregnant woman, her partner, her friends, and family have already fallen in love with the growing baby. In an essay posted earlier this week on Salon, Joyce Maynard describes having a miscarriage the day before she was scheduled to have an abortion. It’s a sad story, and a complicated one. Mourning a miscarriage is, almost always, a complicated business because our culture has no set rules, no rituals, for mourning the loss of a child who was never born. This ambiguity and ambivalence makes the loss even more difficult to deal with, I think, than it might otherwise be. In the absence of custom, knowing how other women have experienced miscarriage is particularly helpful. That's why I’m so pleased to be a part of About What Was Lost: Twenty Writers on Miscarriage, Healing, and Hope. This anthology is the source of Maynard’s Salon essay, and it will be published in January. On a sonogram, a baby’s heartbeat is a twinkling light. It’s like a pulsar flash in the inky void of the ultrasound monitor. It’s beautiful. I know this because I went to the hospital yesterday to check on the baby. There was a little bit of spotting, and I was afraid because this wasn’t the first time I experienced a little bit of spotting. 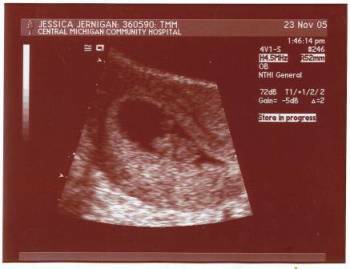 This wasn’t the first time I’d had an ultrasound, either, but it was the first time I saw a baby with a beating heart. My miscarriage began with a little bit of spotting, and when I got an emergency ultrasound, I discovered that my baby was no longer alive. Obviously, it was frightening to see blood again. And obviously, Ted and were relieved and thankful to learn that the spotting was just some perfectly normal implantation bleeding, and we were excited to get a first glimpse of the baby. I can’t say that this happy ending erases or replaces my earlier experience. I wouldn’t want it to: My miscarriage was the most horrible and difficult thing that’s ever happened to me, but it was also important and transformative, and I think I’m a better person for it. I think I can say, though, that my recent experience—so reminiscent of a terrible time, but ultimately joyful—has helped me to be a little less afraid, and a little more confident about this pregnancy. The first time I discovered I was pregnant, I was ecstatic—truly in ecstasy, like Bernini’s statue of St. Teresa (well, kind of like the saint, kind of like the angel). I am fairly certain that I glowed, and I know that I have never been happier before or since. I also know that the despair I felt when I lost the baby was equal to the joy I had felt when I was expecting. The first time I got pregnant, it simply did not occur to me that anything could go wrong. Now, I am afraid to believe that everything will go right. I am happy to be pregnant, certainly, but I’m also afraid of being happy. My first baby was a person to me from the moment I saw the double pink line on the home pregnancy test, and I have never loved anyone like I loved that person. This new baby is not quite as real yet. I don’t think of this baby as a person, but as a bundle of cells the size of a grain of sand—a bundle of cells that might, eventually, become my child. My first baby gave me faith—in life, in existence, in the possibility of divine benevolence—and I lost that faith when I had my miscarriage. I am hopeful, now, but I am also scared.